When Ping launched in early September, the music social network had one major problem: it wasn’t social. Sure, you can share stuff inside of iTunes, but there was no good way to post the songs you liked to the two big social networks: Facebook and Twitter. The truth is that Ping launched with Facebook Connect integration, but it was only for contact importing, and then Apple and Facebook had a bit of a dust up. Today, Apple is bringing Twitter integration to Ping. As Twitter has just announced on their blog, by connecting iTunes to Twitter, you’ll be able to not only find your Twitter friends on Ping, but you’ll be able to tweet out Ping activity as well. That last bit is a key to making Ping actually work in a truly social way. Perhaps even more interesting is that not only will each tweet contain a link back to the song or album on iTunes, but these links will work in New Twitter’s right-side pane. You’ll be able to listen to iTunes previews right from there — a huge feature that should lead to a lot of music buying, especially when the 90-second previews kick-in. Facebook, meanwhile, is still MIA after they cut off Ping a day after launch. There’s talk the two side will hook up again, but so far it hasn’t happened yet. That said, there is a button in the drop down to manually post a song or album to Facebook, but it takes you to Facebook on the web to do it. 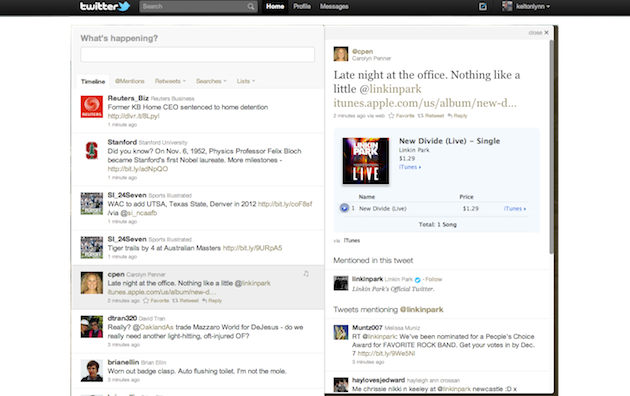 The Twitter integration is fully baked-in. This first big social integration follows Apple integrating Ping with users’ actual iTunes libraries, an important first step. 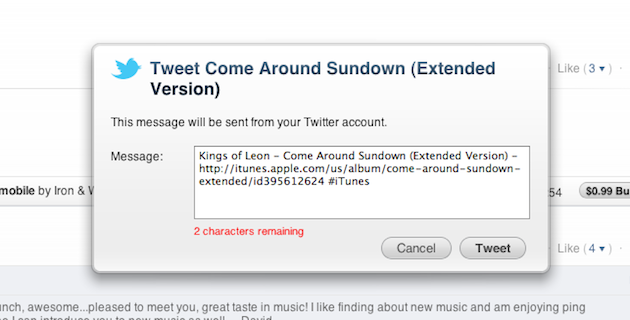 Twitter says this iTunes song previews feature will be available on twitter.com in the 23 countries where the iTunes Store offers music. One big word of caution, when you first hook up your Twitter account to Ping, the default is to auto-tweet out all of your Ping activity — both when you post something and when you just “like” something. It alerts you to this at first and you can change it in your settings so that you can manually choose when to do it, just be warned that this happens. I have to wonder if this deal is a money-making one for Twitter. Will they be getting affiliate fees for songs purchased thanks to Twitter links? I’ve asked Twitter that very question and will update when I hear back. We don’t comment on the underlying financials of our partnerships.